game assets and cutscenes that look amazing. Make 2D game assets that are light and interactive. 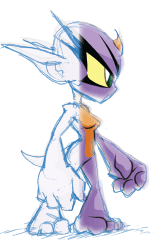 Harmony offers the animation tools, flexibility and performance you need to meet your game development needs. Draw artwork, rig and animate cut-out characters, and easily export assets in a format that works for your game engine. Use Harmony's powerful combination of vector and bitmap tools to sketch, draw and paint your game art. Simple-to-use bone rigs let you quickly create game animation cycles for your characters like jump, run or crouch. Bring interactive 2D game assets into your game engine that look good. Harmony has the tools and workflow needed to export assets optimized for any game engine. Export rig and game animation data in readable XML files, making it easier to integrate game assets into your game engine. 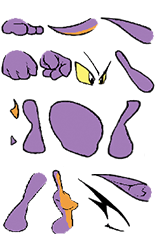 Instead of using multiple representations of a character to convey animation data, Harmony uses individual pieces of a cut-out character in the sprite sheet. 2D animation and rigging data is stored in a separate, very light, XML file. Export settings give you control over sprite sheet settings so you can make your characters interactive and more easily integrate them into any game engine. Free middleware for Unity lets you plug-and-play game assets into the Unity game engine. Cutscenes is where narrative and action meet and players experience story on another level. Storyboard Pro and Harmony streamline the process of creating cutscenes with a workflow that accelerates artistic development: Storyboard Pro to plan cutscenes and Harmony to evolve the visual story to completion. Plan your scene and get the timing right early on. Storyboard Pro lets you make storyboards, block out camera shots, add motion, integrate scripts and create animatics to develop the visual story. Bring your cutscenes to life. Accelerate your workflow by reusing game assets like game characters. Animate with camera moves, add effects and composite with backgrounds to enhance their look for a more beautiful result that really makes the story come together. Export movies for editing and bring final content into your game. Harmony easily integrates into your normal cinematic production pipeline so you can reuse cutscenes, characters and other game assets in your game trailers, marketing imagery, and branding. 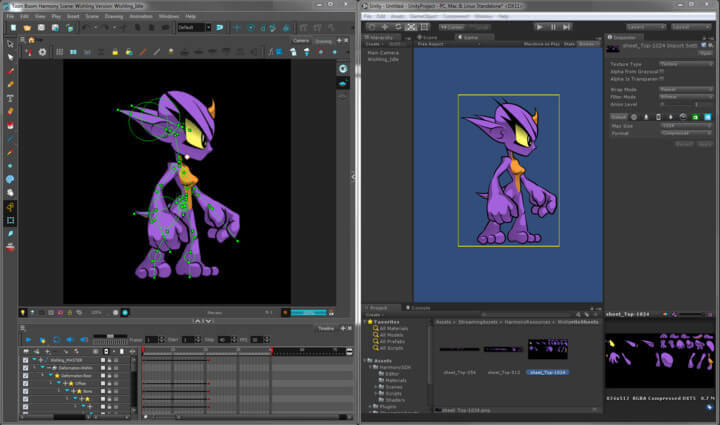 Import game animation and assets into Unity with Toon Boom's free plug-and-play middleware. Use our SDK plugin to export the Harmony sprite sheet along with rig and 2D game animation data in an easy-to-read XML file. Your assets are automatically converted, ready to be put together with your environments, so you can build a great game. *If you plan to use OpenGL, download Unity 5.1.4 for best results with our middleware. Find out how to take game animation and assets from Harmony to Unity. Get the most out of Toon Boom software. Contact us to get help from our team of experts.